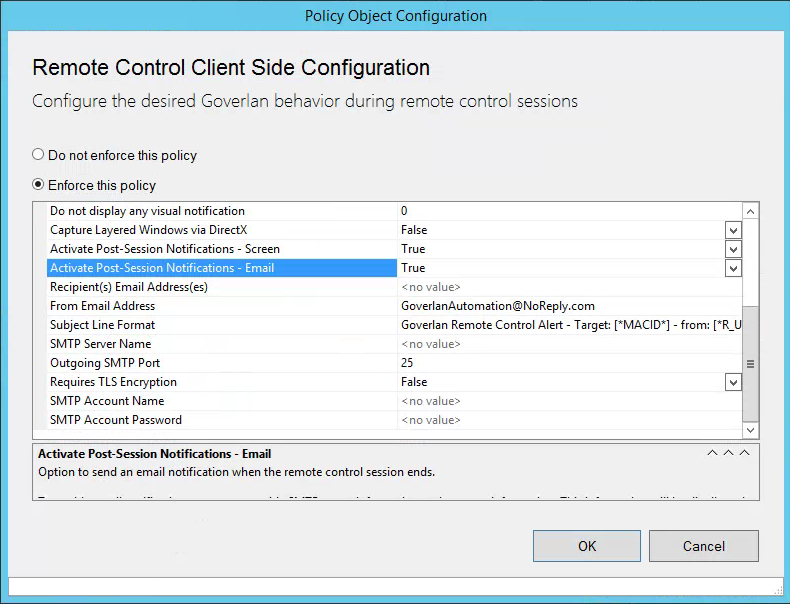 Goverlan allows you to customize the behavior of the Goverlan Client before, during and after a remote control session. For instance, you can configure a client machine to prompt the local user for approval before starting a session, customize or remove notification banners, or configure an email notification to be sent once a machine has been remotely controlled. Manually on a per machine basis via the Goverlan Client Configuration control panel applet. 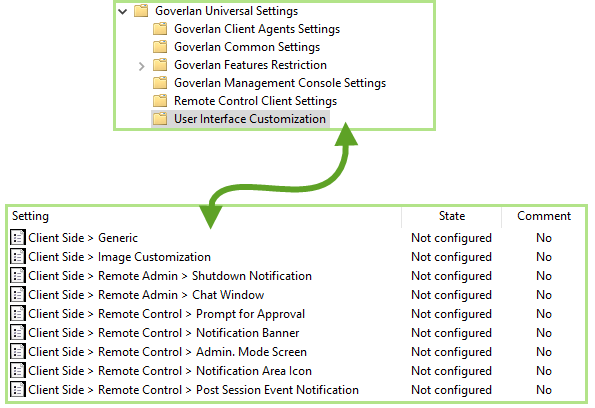 Using a Goverlan IT Process Automation using the Execute > Goverlan Agents > Set RMC Client Settings. Centrally via settings distribution by either using a Group Policy Object (for Active Directory environments), or via the Goverlan Reach Server (see: Centralizing the Configuration of Goverlan). Client side configuration is controlled via the Remote Control Client Side Configuration policy set. No Action– This setting is the default setting. No action will be performed when a session is established. Prompt Local User for Approval– This setting will allow the remote user to accept or deny an incoming session. Disable Remote Control– This setting will disable the ability to initiate a Remote Control session with the remote system. Lock the Computer– This setting will lock the remote workstation when a new session is attempted. Logout the local user – This setting will log off the remote user when a session is attempted. 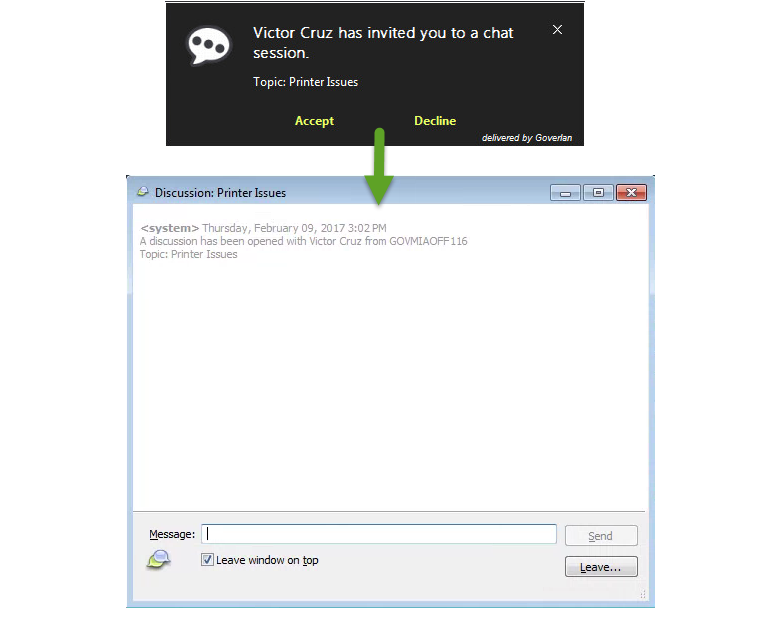 Enable this option to remove all visual notification on the client during a remote control session. This in effect activates a stealth mode which allows you to monitor the activity on a machine without being detected. No Action– This is the default setting. No Action will be performed when the session is completed. Lock the computer– This setting will lock the screen of the remote system when the session is completed. Logout the local user – This setting will log out the remote user after the session is completed. The Post-Session Notification Pop-up can be displayed after a session is complete. The Email Notification feature will send an email to a specified account after a session completes. All Goverlan Reach RC sessions need to be properly authorized to open successfully. By default, the person initiating the remote control session must be a Local Administrator of that machine. However, it is possible to configure a machine to accept Goverlan Reach RC sessions from a specified set of user accounts, bypassing this requirement. Explicitly authorizing a set of accounts to initiate remote control sessions on a machine doesn’t mean that the remote control session will be approved. Remote Control sessions can be attempted. For instance, if a machine is configured to prompt the console user to approve a remote control session, and the console user rejects the session, the session will not continue, even though it was authorized. You can configure a machine or a set of machines to accept remote control sessions from accounts which do not belong to the local administrator’s group. To do so, create a local group named ‘Goverlan Remote Control Admins’ and add the authorized accounts to the group. A user account doesn’t need to be a direct member of the Goverlan Remote Control Admins local group. It can belong to a global domain group which belongs to Goverlan Remote Control Admins. Create a local group named: Goverlan Remote Control Admins in the machine’s local account database. Insert the domain accounts which are authorized to initiate remote control sessions on that machine. Create a domain local group named: Goverlan Remote Control Admins in the domain which contains all the machines to configure. In the case above, all computers which belong to the domain where the Goverlan Remote Control Admins local group has been created will use the group for authorization of local remote control sessions. In this configuration, a Goverlan Remote Control Admins local group defined on a machine takes precedence over the Goverlan Remote Control Admins local group defined at the domain level. The name of the group MUST be called Goverlan Remote Control Admins. Goverlan allows you to customize most text displayed on the client machine as well as some images. This feature allows you to perform company branding or to localize the client side user interface into another language. User Interface customizing is performed via settings distribution by either using a Group Policy Object (for Active Directory environments) or via the Goverlan Reach Server (see: Using Global Policies ). The User Interface Customization folder contains a set policy for each of the user interface items on the client’s side. To modify the text of an item, enable the setting item and change its contents. Once you have configured the Group Policy settings, you will need to wait for those to be distributed onto your machines before you can see the text modifications. 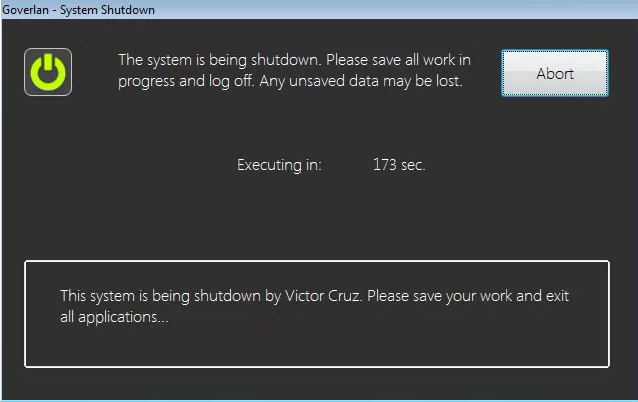 To test your settings on a client machine, open a command prompt on this one and execute a gpupdate.exe command. You can also use the Goverlan Reach Server to distribute text customization onto your machines. 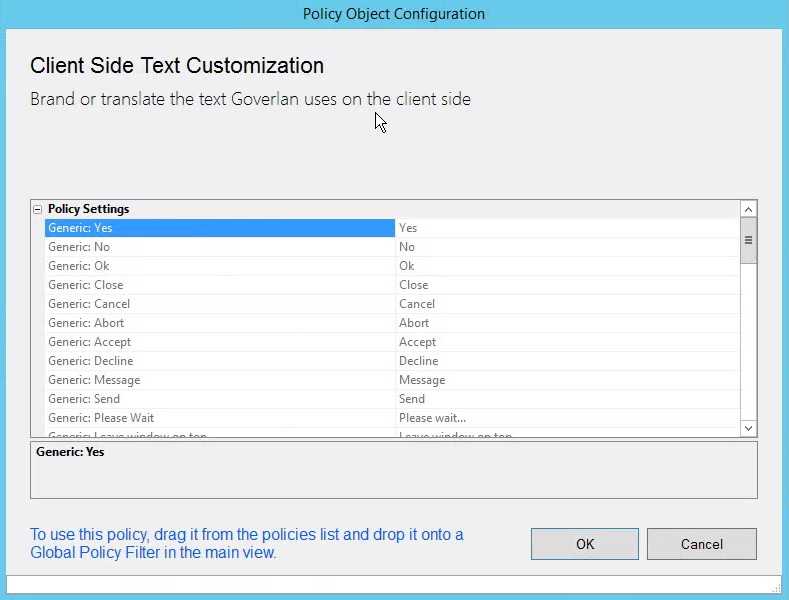 Once you have implemented and registered a Goverlan Reach Server, use the Global Policies feature to configure the text customization. Once your changes have been published, the text modifications are instantaneously reflected on your client machines. Text customization is divided by category. Except for the Generic category, each defines a specific user interface window on the client machine. The following defines these categories. This setting set defines generic strings used on the client side. For instance, the string to be used for “Yes,” “No”, “Ok”, “Close” etc. These settings define the images to be used by miscellaneous windows on the client side. To change the image of a window, generate a transparent image of the requested size in a transparent PNG 24-bit format. Place the image on a network share and specify its full UNC path including file name in the appropriate policy setting. A 128 by 128-pixel image which is used by the Remote Control > Prompt Local User for Approval as well as Remote Control > Notification Banner windows.